When it comes to mixing, no native DAW mixer touches the convenience and workflow of the Reason SSL, Harrison Mixbus included. Integration with the sequencer is second to none as new channels are automatically created on the mixer whenever a new sound source (audio or virtual instrument) is added to a project. Drag/dropping a synth or even a VST into the Reason Rack will simultaneously create a mixer track and a sequencer track for it. When it comes to Mastering, no native mastering suite touches the sound of Scope at 96KHz. Digital Audio Soft MasterIT and BrickMaster, dNa MultiComp and Sonic Core PsyQ are all you need to master an awesome sounding professional final track. From here, it makes little difference whether your synths are top line VST or top line Rack Extensions. They all sound good, including Scope synths and instruments. When I read discussions about whether Reason Rack Extensions sound as good as VST synths, or Scope synths versus Native synths its a non issue when the entire mix is processed through Scope mastering. 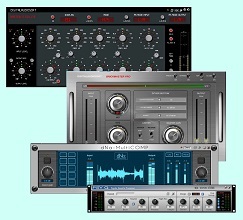 It is after all the entire mix that is all important even when talented developers such as Rob Papen, Reveal Sound, Korg and BlamSoft are producing Rack Extension synths on par or even beyond thier VST counterparts. Scope synths themselves have set the sonic benchmark for many years and of course last year's release of Reason 9.5 allowed the use of VST instruments and effects in Reason. This smorgasbord of synths and other virtual instruments all sound great through Scope. The problem with most DAWS is that they do not have main mixers that look or even act like a real hardware mixer. Instead of knobs, they have text or drop downs. 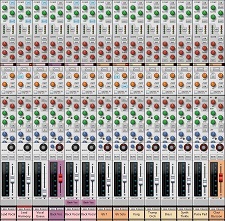 Harrison Mixbus comes close, but has problems running with Scope and the channels contain dropdowns making them too wide so only a limited number of channels can be shown at once. On a 22" monitor you can see 24 channels of the Reason SSL plus the master bus section all at once. That includes the main volume sliders, 6 effect sends, parametric EQ section and dynamics section. All graphical, no drop downs. Gone are the days of having to pair Reason via rewire with another DAW of your choice because of missing functionality in Reason itself. Personally, I haven't used Cubase for a couple of years and my setup is a lot simpler, leaner and CPU friendly with the reduction in ASIO overheads.